This week, the 2015 Fox Creek Three Blocks Cabernet Sauvignon was the South Australian Drink Of The Week. It accompanied some heady conversation about the State Budget with our guest political commentator, Robert Godden. The first thing Steve noted about the wine was its darkness. He said it poured into the glass and was almost as black as the night sky that fell upon State Budget night. Then he commented that on the palate, the experience was like huddling under a corrugated iron lean to in the middle of a Fox Creek vineyard. As the refreshing patter of rain fell, herbaceous and floral scents arose from the ground, mingled with a little earth, and somewhere under the lean to seat, some pressings of spearmint chewing gum also released a faint trace of aroma into the mix. Robert dryly commented that after the cuts to the housing trust in the budget, sadly, a number of people might be seeking refuge in such accommodation! 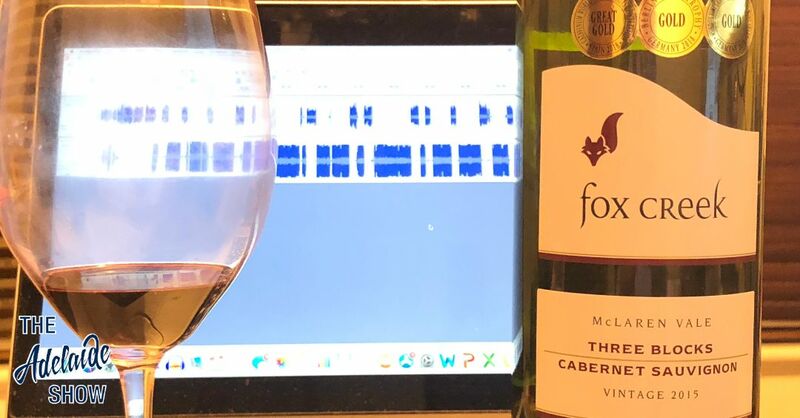 You can hear Steve’s tasting of the 2015 Fox Creek Three Blocks Cabernet Sauvignon in the episode below.